The moonroof can be opened or closed electrically only when the ignition is switched ON. WARNING Do not let passengers stand up or extend part of the body through the open moonroof while the vehicle is moving: Extending the head, arms, or other parts of the body through the moonroof is dangerous. The head or arms could hit something while the vehicle is moving. This could cause serious injury or death. Make sure the opening is clear before closing the moonroof: A closing moonroof is dangerous. The hands, head, or even neck of a person, especially a child, could be caught in it as it closes, causing serious injury or even death. NOTE Before washing your Mazda, make sure the moonroof is completely closed so that water does not get inside the cabin area. After washing your Mazda or after it rains, wipe the water off the moonroof before operating it to avoid water penetration which could cause rust and water damage to your headliner. The rear of the moonroof can be tilted open to provide more ventilation. To fully tilt automatically, momentarily press the tilt/slide switch. To stop tilting partway, press the tilt/slide switch. 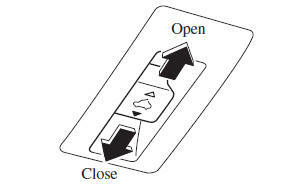 To close to the desired position, press the tilt/slide switch in the forward direction. If the battery is disconnected, the moonroof will not operate. The moonroof will not operate correctly until it is reset. 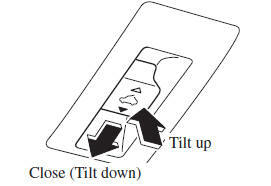 Press the tilt switch, to partially tilt open the rear of the moonroof. Repeat Step 2. The rear of the moonroof tilts open to the fully open position, then closes a little. 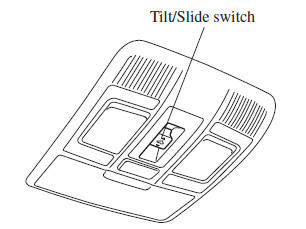 NOTE If the reset procedure is performed while the moonroof is in the slide position (partially open) it will close before the rear tilt opens. The sunshade can be opened and closed by hand. 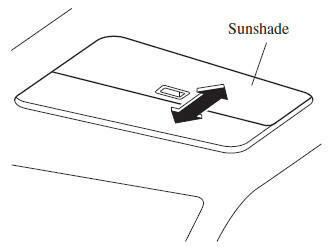 The sunshade opens automatically when the moonroof is opened, but must be closed by hand. The sunshade does not tilt. To avoid damaging the sunshade, do not push up on it. Do not close the sunshade while the moonroof is opening. Trying to force the sunshade closed could damage it.